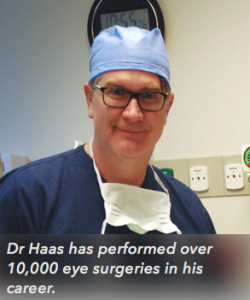 Dr Haas is an expert cataract surgeon. He has performed thousands of surgeries over the course of 20 years. He was among the first generation of surgeons to perform “no stitch” cataract surgery. He obtained his certification from the American Board of Ophthalmology in 1991. He takes a much different approach than the typical “one-size-fits-all” standard cataract procedure. He customizes every surgery to achieve the best visual outcome while putting safety first.